In this walkthrough we’re going to talk about creating AcuGraph treatment plan, focusing on Home Care for patients. In other words, we will show you how to create instructions to send home with the patient for them to provide ongoing self care at home. When we’re looking at the graph, click on the Home Care tab at the top. You’ll see it’s divided in four quadrants. The top left we have Herbal Prescriptions and that’s based on what herbs we prescribed on the Herbal tab. When you make a prescription there, that shows on this box in the Home Care tab. Obviously we want patients to have instruction for how to take herbs properly. So it’s all automatically added for you. The Bottom left box is the Custom Treatment Recommendations. Like the Herbal Prescriptions, the Custom Treatment Recommendations are selected on the Custom tab. When selected there, they show up on Home Care. 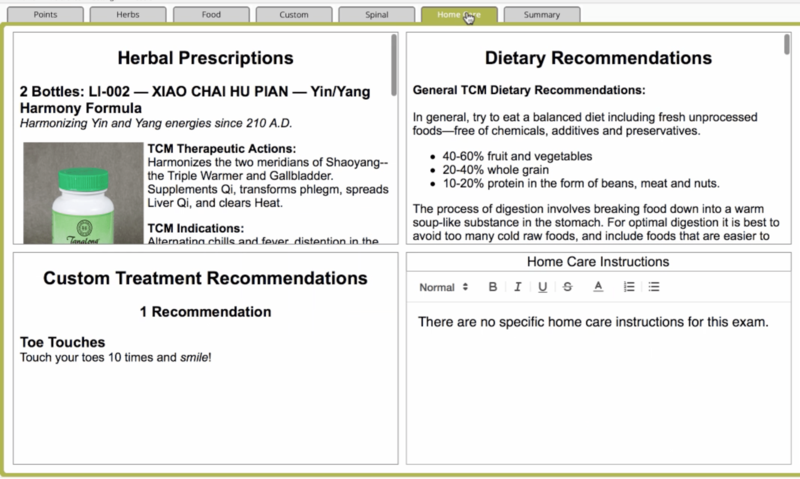 The top right box includes the Dietary Recommendations. These are selected on the Food tab. And on the bottom right we see Home Care instructions. Here you can type specific instructions to be included when you print or email the Home Care information for the patient to take home. These are not saved as a specific note, but are only included with this specific home care treatment plan on this day.